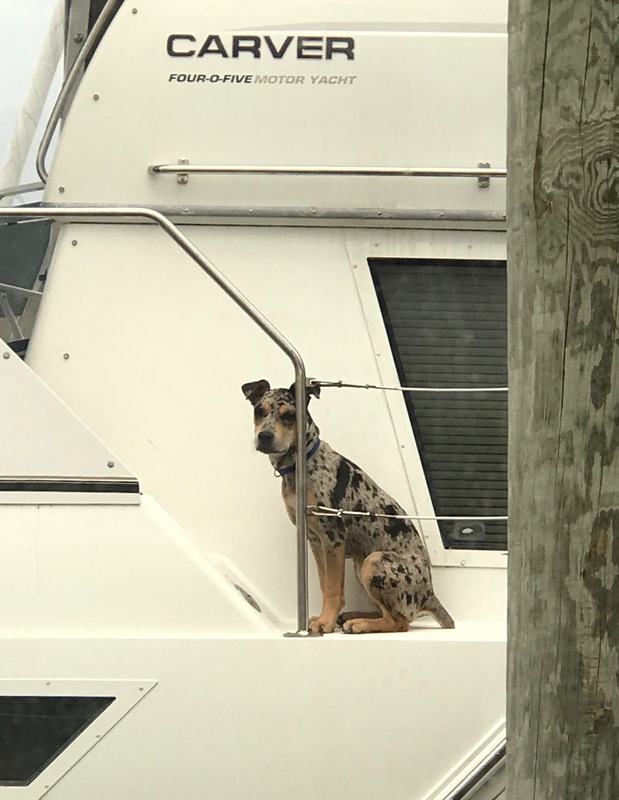 Tom’s brother, Todd, came down to visit for a week and he brought his six-month-old Catahoula Leopard Dog, Houla. with him. It was like having a toddler around! 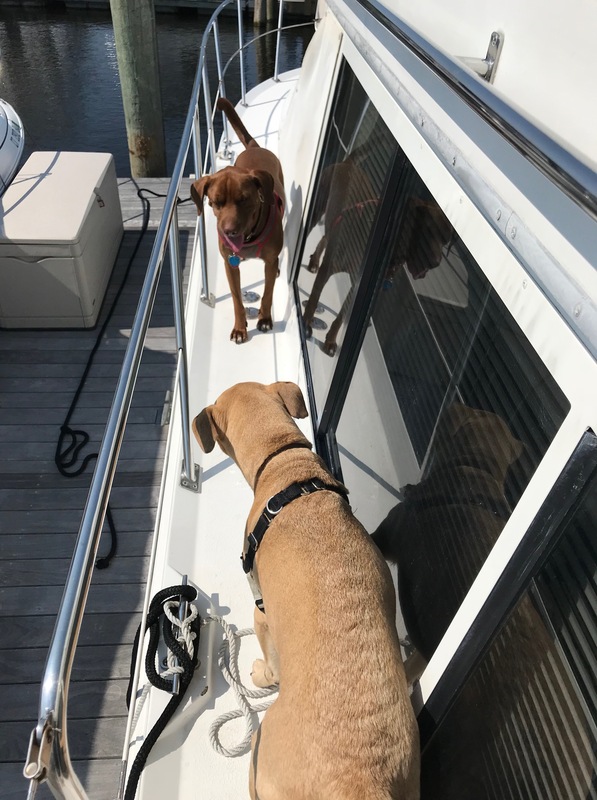 We spent four days on the boat with the three dogs. It was exhausting to supervise the puppy, but it was also a lot of fun. 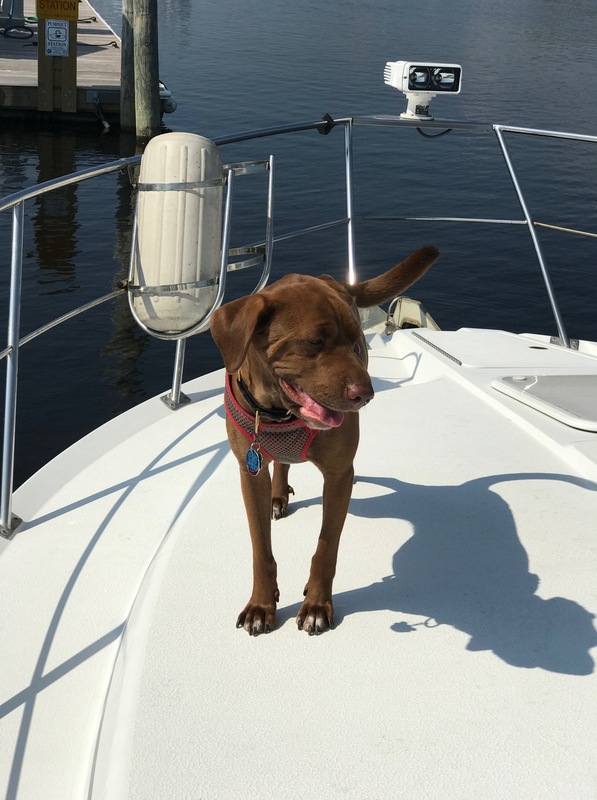 Here are some photos from our time on the boat with our dogs. 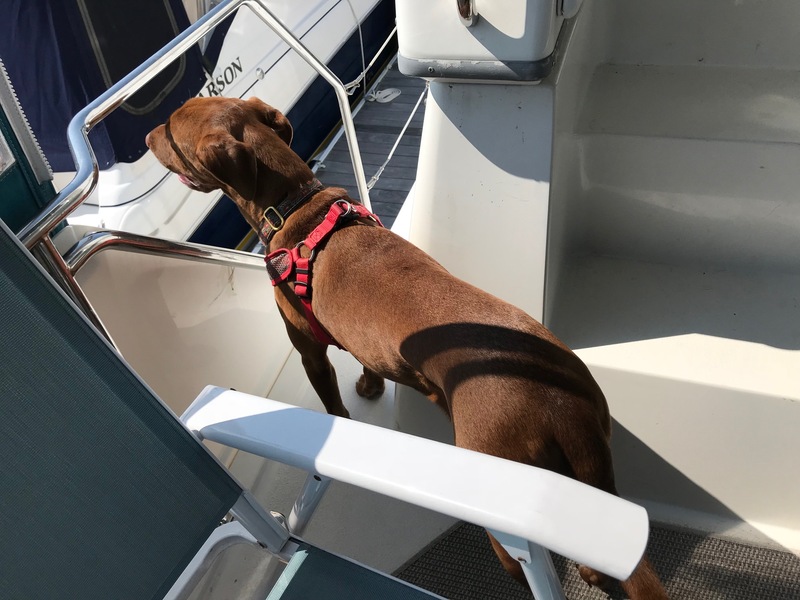 Our dogs are the life of the party, particularly on the boat where there seems to be more ways for them to get into trouble! Love pics of the kids playing. so darn cute. Remy and Houla played well together. But Lexi never stopped growling at the puppy. The last time they were together, Lexi was fine and even played with Houla. But this time, nothing but growls. Maybe it’s because Houla is 6 months now and not as tiny a puppy as when she was here last at 3 months. Houla looks like a Houla lot of fun. Houla is a very smart, very energetic puppy. She pesters my guys constantly to play. Only Remy plays with her though. Remy is only 2 1/2 but Lexi is a senior at 9 years old. Past her romping days. 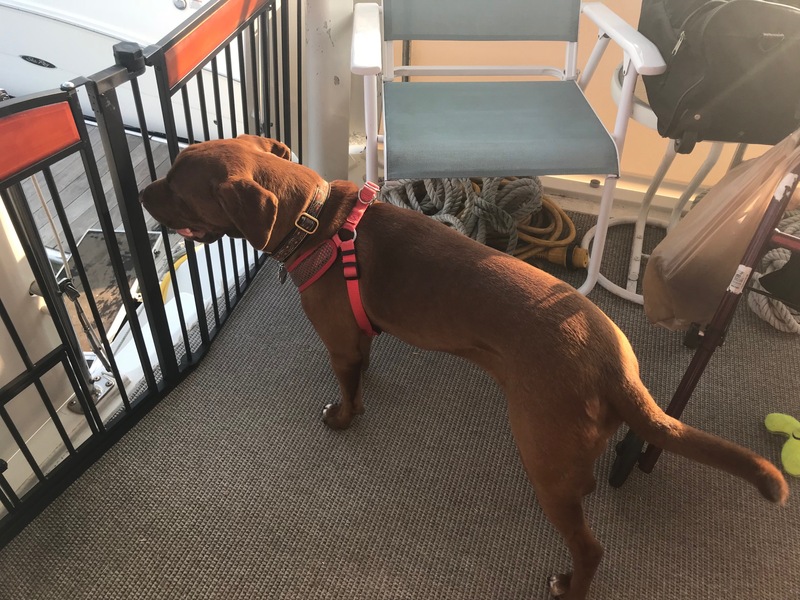 Houla is adorable but lots of work – she needs constant supervision, as you can see by the photos of her on our deck table and checking out the kitchen table. Ellen, do you ever have a problem with the dogs trying to jump in the water? Our dogs are not water dogs. Lexi has been in the water once or twice but was not thrilled. Remy has never been in the water and is not a water breed. So our dogs seem to have no interest in jumping in the water. 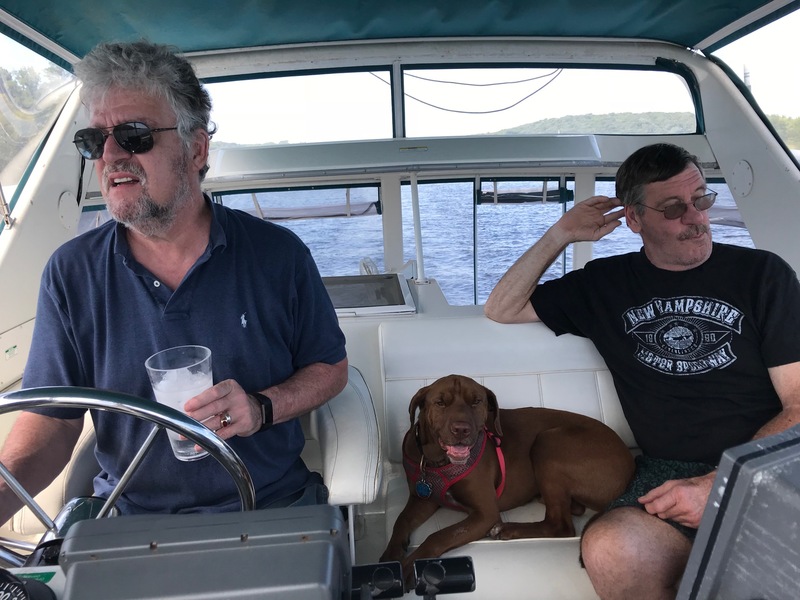 Houla swims a lot in a lake at her home in upstate NY. She loves the water. SO we were afraid she might try to jump in. But she seems to understand that that would not be a good idea. 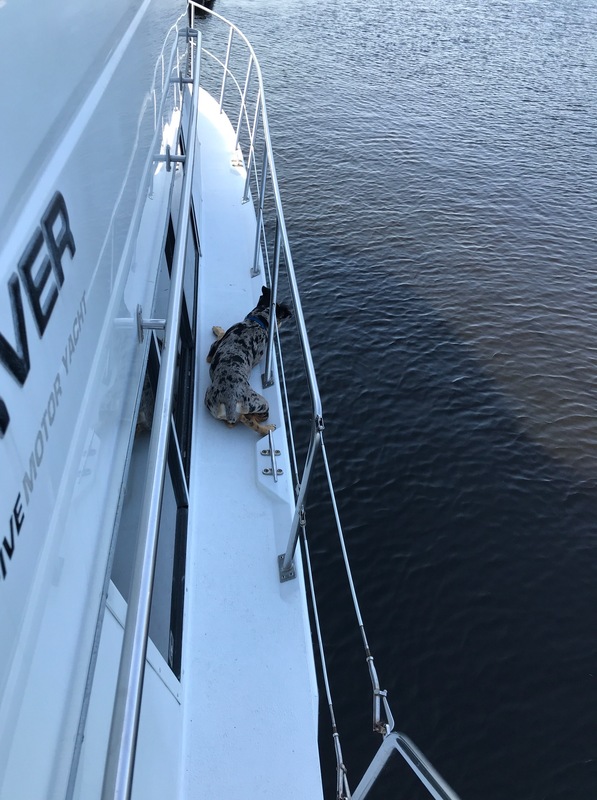 I think because the water is so far down from the deck of the boat. If we were a smaller boat, closer to the water, she might be tempted. WHo knows? We used to take Mac, our first Scottie (mine and Jeff’s) with us to Maine. Mac loved wallowing in the water and was sure he could swim. He could NOT swim. He sank like a rock. 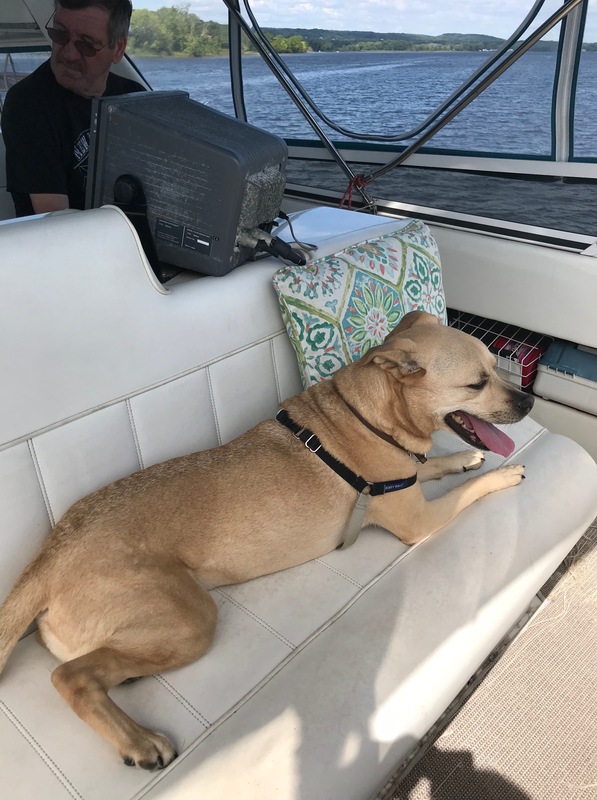 At one point, he jumped out of the rowboat for a swim and Jeff had to go diving to get him. I don’t think they were making doggie life preservers yet, either. 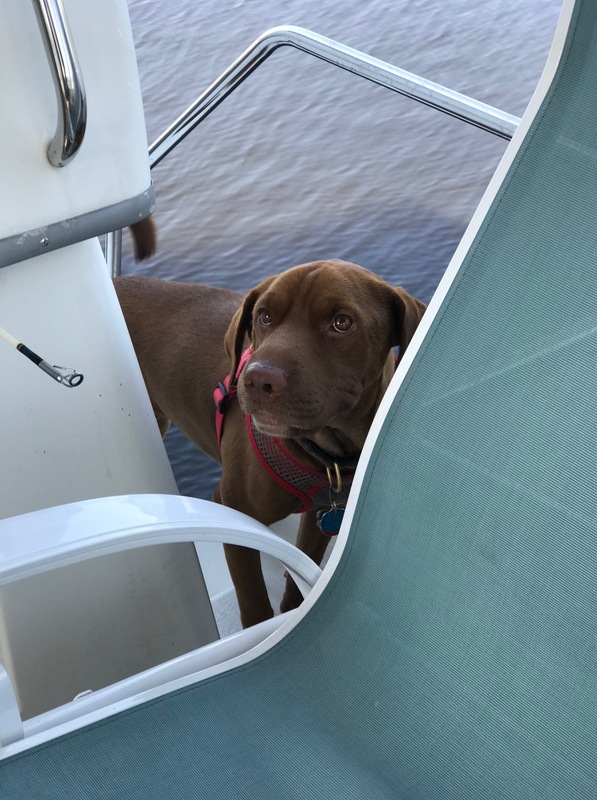 I’ve also had a few dogs who LOVED the water and would jump into anything wet, including waterfalls and oceans and culverts and I learned the hard way: there is no such thing as too cautious! On the whole, small terriers don’t swim well. Not enough leg for the body length. But our Keeshund (Dutch barge dog) LOVED the water. ANY water anywhere. And our English Setter loved anything wet — including mud. And he was WHITE. Yuck. Divot liked to swim a little, but she kept close to shore. Our big hounds loved to swim and we kept them away from the water because they didn’t have any common sense about needing to come BACK. Tom loves to tell stories about George and Mac. 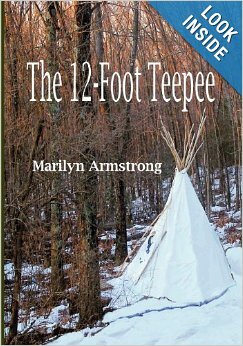 Including the story about Mac trying to swim and sinking like a rock! Poor guy. He so wanted to be a water dog! Yes, and nothing could convince him that his little legs were simply NOT long enough.